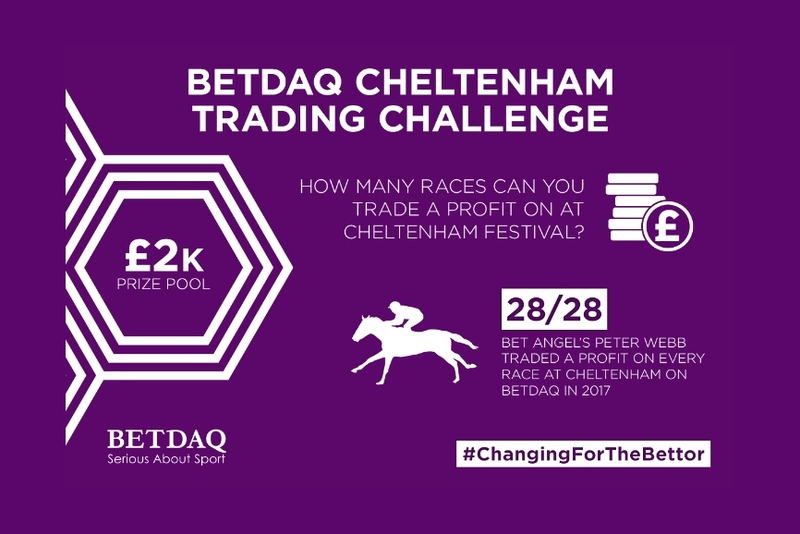 CHELTENHAM TRADING CHALLENGE: BETDAQ has launched the Cheltenham Trading Challenge, offering customers of the 2% exchange the chance to win a share of a £2,000 prize pool. Traders are tasked with emulating the achievements of Peter Webb, who returned a profit on all 28 races at the 2017 Festival on BETDAQ. Webb, founder of cutting edge software company Bet Angel, has been successfully trading betting exchanges since their inception in 2000. The trader that profits on the most individual races in total at Cheltenham, using any BETDAQ Trading Tool product, will be rewarded with a £1,000 bonus, with second place receiving £700, and third collecting £300. The competition is the latest part of BETDAQ’s #ChangingForTheBettor campaign. Since launching in January 2018, with a move to a flat rate 2% commission exchange, BETDAQ has seen a 26% increase in activity. Shane McLaughlin, Director of Exchange, Ladbrokes Coral Group, said: “The Cheltenham Festival is an incredibly competitive week of racing and for Peter to successfully trade all 28 races in profit on BETDAQ in 2017 was a fantastic achievement. Peter Webb said: “I first started using BETDAQ seriously in 2008 and have grown my activity substantially since then, culminating in getting a clean sweep of 28 profitable races at Cheltenham in 2017. The Ladbrokes Coral Group-owned exchange is title sponsor of the Punchestown Champion Hurdle and BETDAQ Chase Day at Kempton, principal partner of Charlton Athletic Football Club, and includes the Racing Blogger and Tony Cascarino among its ambassadors.